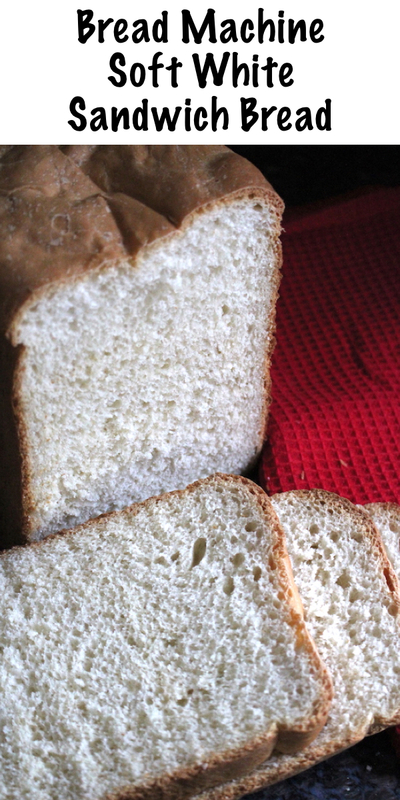 Making your own white sandwich bread in a bread machine couldn’t be easier. Just put the ingredients in the machine, push the button and a few hours later open it to find fresh baked soft white sandwich bread. 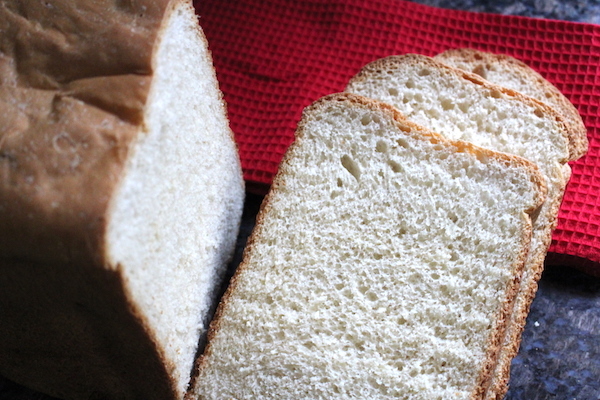 Everyday white bread is one of those simple pleasures that just makes a day whole. Nothing complicated, but just right for complimenting the perfect sandwich. I love baking my own bread, and tasting the fresh warm flavors right out of the oven. More often than not I choose a hearty multi-grain bread, but now that I have two toddlers at home, crusty loaves and 7-grain breads are on the back burner. When I found a bread machine at a local thrift store it took me back to my childhood. My mom never made bread, but one Christmas she was gifted a bread machine. All winter she played with that machine, baking several loaves a week. It was a welcome change from the styrofoam flavored wonder bread from the grocery store. Now that I have my own kids, I know why my mom never made bread. It’s tricky to find that kind of time, even with two little ones always trying to “help.” I’ve been pretty successful on occasion making a soft Amish white bread with their help, but it doesn’t come anywhere close to providing for all our bread needs. Now that I have a bread machine in the house though, we haven’t bought store bought bread in quite some time. I can have the ingredients prepped and a loaf started in about 2 minutes, which is usually about as much time as I have between being tackled and breaking up baby battles. The main thing to know about bread machine baking is that choice of yeast matters. Most yeast is designed to be dissolved in water before other ingredients are added. Bread machine yeast is different. Water, salt and sugar go into the bottom of the machine, then the flour floating on top and then finally a scoop of bread machine yeast. This order allows you to use a timer on the bread machine, and start the loaf with a delayed start so that it’s ready right when you get home from work. The yeast stays dry until the machine starts, which is perfect for a delayed start. Bread machine yeast is also designed for a rapid rise, which helps a bread machine complete a loaf relatively quickly. Since I still do make homemade bread in the oven, I wasn’t excited about keeping two types of yeast in the house. I’ve had great success with a brand called Saf-Instant Yeast, which is perfect for both oven baking and bread machine use. It’s sold in a 1 pound bulk package for about $4, and the same amount of yeast in tiny packets would cost about $65! This has been a real game changer for my home bread baking, and it’s really helped keep costs down when we’re baking 2-3 loaves a week. I’ve found that it works best if I put the Saf-Instant Yeast into the water to dissolve, rather than on top of the flour as a dry ingredient. With that one modification, I don’t have to keep two types of yeast in the house. 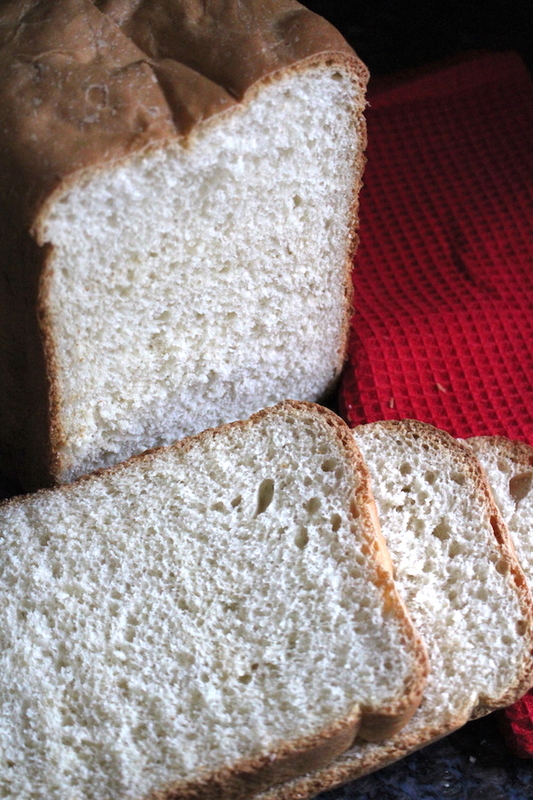 Making white sandwich bread in a bread machine couldn’t be easier. While a crusty french loaf may only have flour, yeast, salt, and water, a soft bread needs a few more things. To get a really wonderful soft sandwich bread, a bit of butter helps to create a tender crumb. The addition of a small amount of milk and sugar helps round out the flavor and create a wonderful texture. Since I’m using Saf-Instant Yeast instead of special bread machine yeast, it goes right into the water with the sugar and salt. If you’re using bread machine yeast, be sure to add it on top of the flour. 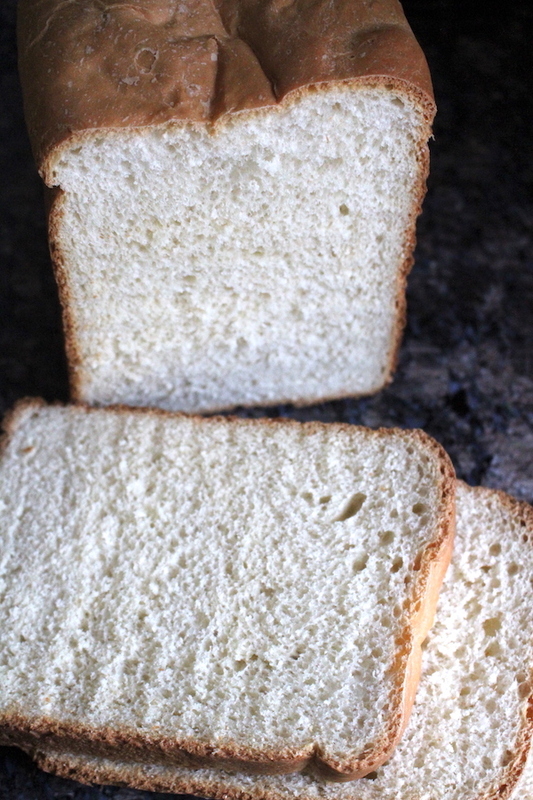 This recipe makes a 2-pound loaf of soft white bread. Select the basic setting on your bread machine for a 2-pound loaf. On my machine, that cycle takes an even 3 hours from start to finish. This simple white bread comes together quickly in a bread machine, with only 2 minutes of active work and 3 hours from start to finish. Set the machine to a basic 2 pound loaf and press start. Allow the bread to cool completely before cutting. If using a generic instant yeast, add it into the water before adding the flour. If using a bread machine yeast, place it on top of the flour instead.